Pattern Size: I selected a size 48 this time, based on my "full bust". Marfy patterns come in varied sizes depending on the design. The website will tell you what size you should cut. I based my selection on the "full bust" circumference, not by the "upper bust" as instructed in my video on How to Choose a pattern size. 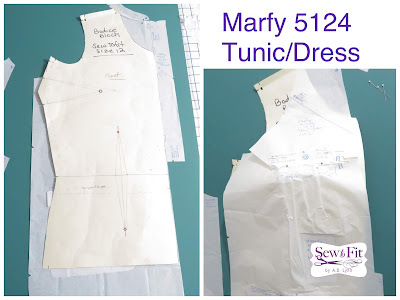 While working through this challenge, I have decided to base all my selections on their published sizing instructions found on their website or in the back of the Marfy Pattern Catalogue. To start my fitting process, I draped/tissue fitted the pattern on my dressform, by first pinning all the details to the pattern front, so that I can check placement of each design element in order to check its placement on my body "double". After checking the placement of these details, I made note of the fitting ease needed and compared it to my dress block. You can see the picture of the pattern on my dressform and overlayed with my block. I had to make sure that the upper "chest" mock pocket flap was not in a bad spot. That seam will need to be moved up so it won't be directly on the apex. The comparisons above, revealed that I needed to raise the upper bodice by at least one inch, a need for a 1" FBA and an additional side adjustment at the hip. I proceeded to shorten the entire area by folding a tuck out of the bodice above the full bust. This adjustment was made on all upper bodice pattern pieces: Front, Front placket, Sleeve, and back. I added a full bust adjustment to only the "yoke" and adjusted the gathering at the yoke seam, in order to minimize the amount of fabric at the apex mound. For the side seams, I did a pivot and slide out 3/4" inch to give me more around the hips graduating back in towards the waist. No additional width was added on the sides near the bust line. 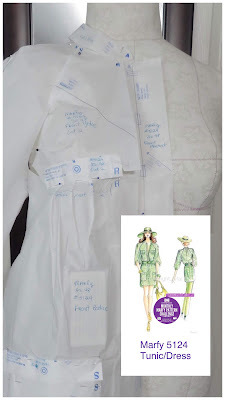 It may seem complicated from these pictures, but I think, if you pin the pattern together and see it on a form, in tissue form, you will see the places that need to be changed before you start cutting a test garment or toile. I used a regular fabric to sew a wearable muslin for this project. I was not happy because I overlooked the placement of the pocket before cutting the fabric. All the other alterations were made prior to cutting the test garment, and it fit perfectly, except for the mock pocket flap placement. Full details and a demonstration of all these adjustments will be documented in full on my youtube channel later. Up next is Episode 3: Video Reveal. Becky and I will livestream our outfits and discuss our sewing process and pattern review. If you haven't caught up with the challenge, please check out the first blog post where I explain the rules of the challenge. 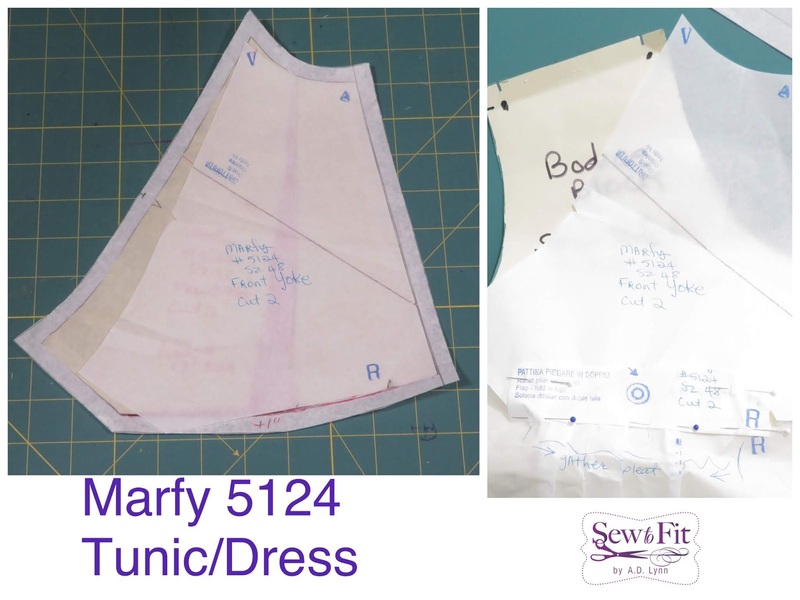 In short, Becky and I have challenged one another to sew a new Marfy pattern each month. You can follow the process and our makes on either of our instagram accounts as well as my youtube channel. We go live on youtube on the first Saturday of the month at 8pm central. Last month was this top, Marfy 5209. I decided to make a couple more over the next few months. This is my second version sans the neck tie. I rather like this version better because I can just leave the top two buttons undone for a more relaxed casual look. Follow my Instagram feed to see a full gallery of my sewing projects. You will pretty much know what is in my closet just by following my instagram feed. (It's much easier to scroll than flickr.) The fitting details and pattern discussion are in this blog post. Pattern Selection: Each month, we select two different Marfy patterns, that we each would like to sew. They may be from the Marfy online website at Marfy.it or from one of their mail order catalogues. 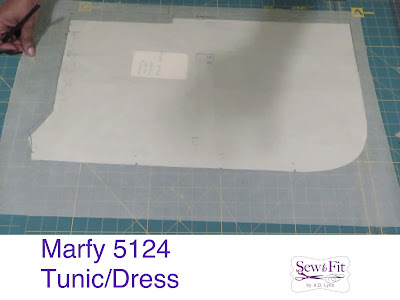 Voting: During the live webcast, you will vote via a live poll on my YouTube channel, SewTofitbyAdlynn, for ONE of the two we select as our challenge garment for the month. We have until the next show, to sew the garment and do a reveal. Fabric Selection will be made by us after you have voted on the pattern. You will learn what fabric we selected during the reveal. (Our fabric choices are sponsored by Sew Much Fabric). The replay will be available if you can't watch live, although voting will have ended.